Peppermint Candy (박하사탕) is an exceptional piece of cinema. Opening the Busan International Film Festival in 1999, it must have been uncomfortably ironic for the audience that such a prestigious Asian festival would feature such a poetically raw dissemination of Korean culture. Directed by auteur Lee Chang-dong (이창동), the film critically examines a twenty year period of Korean history, revisiting pivotal moments through the main protagonist while also psychoanalytically deconstructing his – and by extension, Korean -masculinity. Peppermint Candy is a simply breathtaking exploration of how a person’s life is forged through culture and trauma and, featuring a staggering performance from Seol Kyeong-gu (설경구), is one of great examples of the vibrant socio-cultural power of Korean filmmaking. In 1999, a man named Kim Yeong-ho (김영호, Seol Kyeong-gu (설경구) emerges by a riverside where a group of middle aged people are having a picnic. Interestingly, members of the group recognise Yeong-ho and invite him to join them but his erratic behaviour proves too much to bear. Leaving the picnic, Yeong-ho climbs onto train tracks with the intention of suicide, yet just before the train collides he screams, “I want to go back!” Suddenly Yeong-ho begins to revisit key moments from his life – and Korean history – that forged him into the person he has become, including meeting his estranged wife Yang Hong-ja (양홍자, Kim Yeo-jin (김여진), his career as a police officer, and his first love Yoon Soon-im (윤순임, Moon So-ri (문소리). Director Lee Chang-dong has crafted an incredible journey through exploring the life of Yeong-ho, conveying his personal development as inherently tied to the development of Korea over a twenty year period. Initially, Yeong-ho is supremely dislikable and downright weird as he crashes the riverside picnic, behaving terribly towards people who are simply attempting to welcome him. Yet from the moment Yeon-ho steps onto the train tracks, it becomes clear there is a depth to his madness. Over the course of Peppermint Candy director Lee Chang-dong peels back layer upon layer of Yeong-ho’s psychosis in a highly poetic, subtle and symbolic manner, examining how a person’s innocence is twisted by culture and forces beyond control. The train track, for example, is much more than a place for suicide as it comes to represent his path of destiny. As the train moves back in time to revisit Yeong-ho’s past it becomes his timeline, stopping at pivotal moments until the symbolic sound of the train horn conveys that it is time to move on. As such the train and track are ethereal, spiritual beings within Peppermint Candy and are beautifully poignant narrative devices. As the train gently takes the audience deeper into Yeong-ho’s history, a great deal of empathy is aroused as his very character is stripped bare. From the initial quick judgement that Yeong-ho is an odd fool, each turning point in his life delicately alters the rash perception to the point where genuine sympathy is evoked from his personal tragedies. When his business suffers as a result of the Asian financial crisis, when his marriage begins to fall apart, when he loses his first love; all have penetrating emotional and psychological impact on Yeong-ho, and it is utterly enthralling to behold the events that molded him into his suicidal state. Director Lee Chang-dong also masterfully ties Yeong-ho’s increasingly fractured state as inherently Korean. 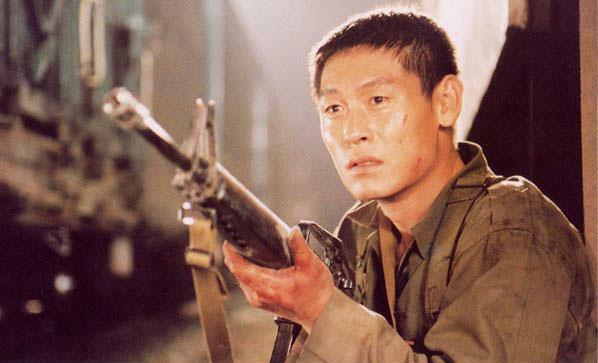 As well as the aforementioned financial crisis, Yeong-ho’s career in the police force during the infamous brutality of the 1980s is portrayed, in addition to his role in the 1981 Gwangju Uprising (or rather, massacre). In each instance, the director examines not only the manner in which Korean people were brutally oppressed during the era but also how men such as Yeong-ho, who is an analogy of all Korean men during this period, were fundamentally changed into abhorrent examples of humanity. Issues such as violence and patriarchal order are interrogated in compelling fashion and conveyed not as features of masculinity, but as cultural constructs that warp the innocence of young males. Yeong-ho’s journey into the past is also enthralling due to the phenomenal performance of Seol Kyeong-gu. Throughout the entirety of Peppermint Candy the actor is superb in articulating the emotional and psychological state of Yeong-ho with incredible sincerity. From his unhinged suicidal behaviour through to his bitter and violent 30s, from his attempts to rebuild his life following military service through to his innocence as as student, Seol Kyeong-gu is simply amazing. His performance is keenly heartfelt at every stage of Yeong-ho’s life, so much so that his journey of self-discovery lingers long after the film has come to an end. His victories at the Grand Bell Awards and Blue Dragon Awards in 2000 attest to his prowess, and are completely deserved. 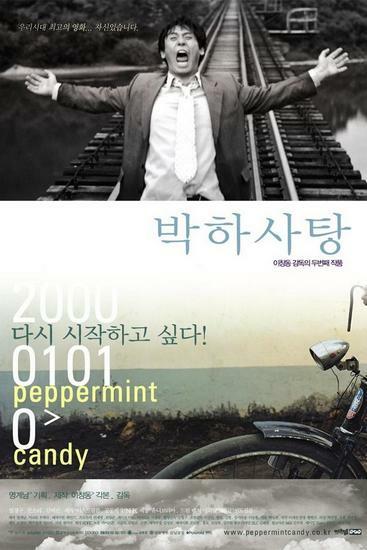 Peppermint Candy (박하사탕) is undoubtedly one of the modern classics of Korean cinema, and is an exceptional entry by director Lee Chang-dong (이창동). The story is equal parts poetic and subtle as well as raw and compelling, as the emotional and psychological layers of main protagonist Yeong-ho are gradually peeled away. In doing so the director intricately examines the notions of contemporary Korean masculinity, yet it is made even more enthralling through the link with defining moments in Korean history. As such, Peppermint Candy is a journey both personal and national, and coupled with the phenomenal performance of Seol Kyeong-gu (설경구), is an absolute must-see.